Each November, the Tori no Ichi Festival takes place at Hanazono Shrine, a Shinto shrine located not far from Shinjuku Station in Tokyo, Japan. At Tori no Ichi festivals, held all over Japan, lucky charms or rakes known as Kumade are available for sale. 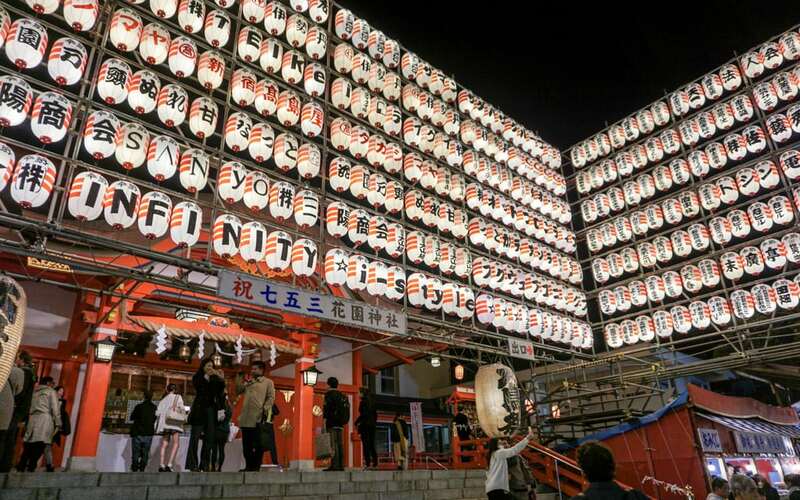 The festival held at Hanazono Shrine is one the most important in the Kantō region of Japan. In Tokyo, you can find these festivals at many other temples including Asakusa Temple and Chokoku Temple. 2018 Dates: The Tori no Ichi Festival will be held at Hanazono Shrine, and other Otori-jinja shrines in Japan on November 1, 2018. Hanazono, which translates to Flower Garden, is a Shinto shrine established in the 17th-century during the Edo Period. Over the years, the shrine has been rebuilt and renovated as the result of damage by fire and war. At a time, the land surrounding the shrine belonged to the Imperial Gardens. In the mid 19th-century, vegetables such as bell peppers and squash were grown on surrounding fields by farmers. After all these centuries, Hanazono Shrine still exists, even if surrounded by the massive skyscrapers of Shinjuku. Visiting the shrine is a great way to find peace and tranquility in the busy city. The Tori no Ichi Festival take places each November on days of the Tori (rooster). As the day of the rooster occurs every 12 days in November, the festival occurs two or three times during the month. If you are familiar with the Chinese calendar, you might recognize the rooster as one of the twelve animal signs of the Oriental zodiac. During the festival, worshipers visit one of many open-air stalls at the temple to buy Kumade. A Kumade is a bamboo rake often decorated in Japanese masks, gold coins, silver, and lucky cats. The Kumade, considered a lucky charm, helps bring wealth and good fortune in both life and business. When a rake is sold, you might see a seller and buyer clap their hands in rhythm with each other. This custom, known as tejime, is usually performed at the end of special events. If you happen to see the ceremony taking place, feel free to join in. Another great thing about the Tori no Ichi Festival were the many great food stalls. As I walked around the grounds of the shrine, I couldn’t help but notice all the street food vendors. Some of the foods I recognized while others were new to me. The amount of food options was overwhelming. My advice: walk from stall to stall until you see something you like. Even if you can’t speak Japanese, just point to what you want. Though most people visiting the shrine were Japanese, the vendors were friendly to visitors like me. Eating street food shoulder to shoulder with Japanese at a shrine in the middle of Tokyo was an experience I will never forget.